I'm Running to Eat! : Holy Frijoles, Batman! The weather has been great for running. It seems -- at least for the moment -- that Spring has arrived. Of course it's hard to get too excited when the weather man is forecasting temps way below normal for next week. Oh yeah. With lots of rain too. So even though the weather has been perfect for running outside lately, I haven't been doing much of it. My friends have though. The River-to-River Relay was this weekend. The R2R is an 80 mile relay through hilly southern Illinois. Eight people make up a team and each team member runs three legs of about 5K each throughout the day. It's hot, hilly, brutal ... and tons of fun! My former team ran their hearts out this weekend and placed 2nd in the Female Masters division. Go Tailwinds! Several members of my local running club ran the Boston Marathon today. They all did great but Tom D really rocked it, placing 5th in his age group. Go Tom! Watching Robert Cheruiyot fly up those hills today has really inspired me to get more serious about my training. I even went out and did a couple miles before dinner tonight! While I haven't much been in the mood for running much lately, I have been in the mood for spicy Tex-Mex food. 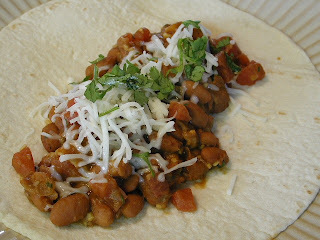 The other night I mixed up a batch of these beans to go with the Pork Carnitas I made. I love these beans because they are great as a side dish or rolled into a tortilla for a quick lunch, on top of a salad or even cold from the fridge! I love cilantro. I think it's my favorite herb. I can't get enough of it. Unfortunately dh despises it. I usually make the beans and leave out the cilantro then separate out some for dh and then add all the cilantro to the remaining beans and let it simmer for a minute before serving. In a heavy pot cook the bacon pieces until well done. Do not undercook the bacon. Add 2 tablespoons chopped garlic, 3 tablespoons cilantro, and chopped onions to hot bacon. Cook until onions are transparent. Rinse beans until no foam remains. When onions are ready add beans, cumin, and chili powder. Stir and add 2 cups of chicken stock. Turn heat to medium low. Add salt and stir. Cook beans slowly until fork tender (approximately 1 hour). Stir often to avoid burning the bottom. Add more chicken stock as needed. Add tomatoes, remaining garlic, and cilantro, and serve.